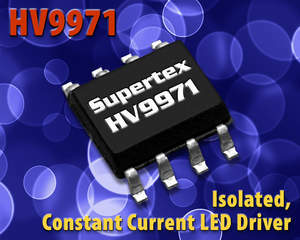 SUNNYVALE, CA--(Marketwire - March 3, 2011) - Supertex (NASDAQ: SUPX), a recognized leader in high voltage analog and mixed signal integrated circuits (ICs), today introduced HV9971, a patented, isolated, constant current LED driver for solid-state lighting applications. HV9971 has a current accuracy of +/-3% and is ideally suited to control isolated, flyback topologies to enable solid-state lighting fixtures to meet UL compliance for galvanic isolation. The IC utilizes primary side current sensing for reduced component count, circuit size and cost; and is still able to achieve highly accurate output current regulation. Supertex's patented approach maintains current accuracy while the IC is insensitive to external component tolerances and does not require an optocoupler. HV9971 accepts AC input voltages of 80-264V and is optimized for operation at a constant frequency of 100kHz. "HV9971 requires no secondary current sensing components, making it an ideal solution for reducing board size and parts counts in LED lighting applications," states Stephen Lin, Vice President of Marketing for Supertex. "This IC is well suited for incandescent bulb replacement applications where galvanic isolation is required." The HV9971 is available in an 8-lead SOIC package (HV9971LG-G). The part is RoHS compliant. Samples are available from stock. Lead-time for production quantities is 4-6 weeks ARO. Pricing is US$0.88 each for the HV9971LG-G in 1K quantities. Supertex, Inc. is a publicly held mixed signal semiconductor manufacturer, focused in high voltage analog and mixed signal products for use in the medical, LED lighting, display, industrial, and telecommunication industries. Supertex product, corporate and financial information is readily available at www.supertex.com.